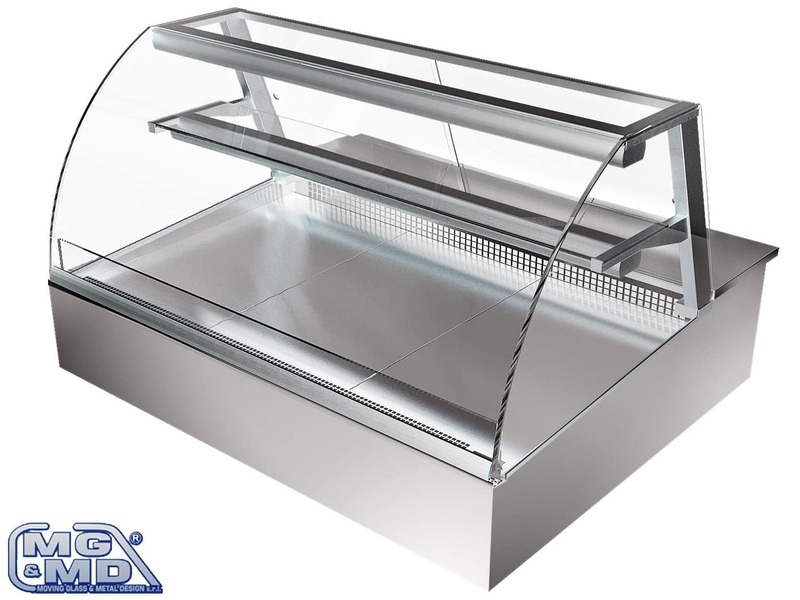 “Bordeaux” model display case, with horizontal raised display deck, is ideal for the display of product on baking-pan or tray, suitable for pastries, yoghurt shops and yogurt shops with a refined design. In fact it’s possible to fit, besides traditional glass frame structures, curved front stud model that allows to realize 45° and 90° spherical corners. As other display cases, the glass frame structure of bordeaux model is silver anodised as standard ( or gold anodised on request), with neon light on the top and on the intermediate shelf; with plexiglass deflectors also on the sides (for refrigerated element), with tank lined up end sides. All versions (ventilated refrigeration; static refrigeration; neutre for pastry or bread) are coupled between them with the possibility to realize ambient corners on request. Intermediate shelf without neon light. Intermediate shelf with neon light. Outside tank in stainless steel at sigh.